The Jacksonville Jaguars had gone from first-year expansion team to playoff participant, reaching the AFC Championship game, a year later in 1996. Head Coach Tom Coughlin’s club started slowly but came on strong in the second half of the season, with the NFL’s second-ranked offense (and first-ranked passing offense) leading the way. QB Mark Brunell and wide receivers Jimmy Smith and Keenan McCardell distinguished themselves and veteran RB Natrone Means provided a vital spark during the playoff run. 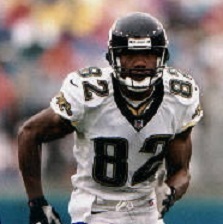 On August 31, 1997 the Jaguars traveled to Baltimore to open their third season against the Ravens, a team they had twice beaten the previous year in closely-contested games. However, after taking all of the team’s snaps in ’96, Brunell suffered a preseason knee injury that made him unavailable for Week 1. In his place would be Rob Johnson (pictured above), a highly-regarded third-year backup who had performed very well in preseason games but, due to Brunell’s durability, had seen scant action during the regular season. He would be making his first pro start. The Ravens, coached by Ted Marchibroda, were starting their second year in Baltimore following the move of the franchise from Cleveland. Like the Jaguars, they featured a strong passing game led by 33-year-old QB Vinny Testaverde, who was coming off a Pro Bowl season. However, the injury-plagued defense gave up 441 points and the team ended up with a 4-12 record. There were 61,018 fans in attendance at Memorial Stadium for the late-afternoon game. In the first series, the Jaguars drove 84 yards in eight plays. Rob Johnson completed all three of his passes, the longest to Keenan McCardell for 25 yards that moved the ball into Baltimore territory. Facing a third-and-three situation at the 25, Johnson ran the ball himself up the middle for a touchdown. The Ravens went three-and-out on their ensuing possession although Greg Montgomery’s punt traveled 53 yards to the Jacksonville 7. LB Peter Boulware sacked Johnson for a three-yard loss on the first play but the young quarterback came right back with back-to-back completions to McCardell that gained a total of 20 yards and a first down. Johnson completed two more passes for sizeable gains as the Jaguars went 93 yards in 12 plays. A throw to TE Ty Hallock picked up 23 yards to the Baltimore 44 and a completion to RB James Stewart on a third-and-13 play was good for 31 yards to the one yard line. Three plays later Natrone Means gained the last yard for a TD and, with another successful Mike Hollis extra point, the score was 14-0 at the end of the first quarter. The Ravens had the ball as the second quarter started and their offense had come to life. On the last play of the opening period, Vinny Testaverde connected with RB Earnest Byner for a 17-yard gain to the Jacksonville 29. Four plays into the second quarter Testaverde threw to WR Jermaine Lewis for a 17-yard touchdown and, with Matt Stover’s extra point, it was a 14-7 game. Now it was the Jaguars going three-and-out on offense and the Ravens regained possession at their 26 after the resulting punt. Converting two third downs along the way, Baltimore took eight plays to go 74 yards and score again. Testaverde completed seven passes, including the last one to Lewis that was good for a 42-yard TD. Stover tied the game at 14-14. The teams traded punts until Jacksonville FS Chris Hudson intercepted a Testaverde pass and returned it 23 yards to the Baltimore 34. The Jaguars moved backward thanks to a sack and holding penalty, but facing second-and-19, Johnson hit Jimmy Smith (pictured at left) for a 22-yard gain. Two plays later he found Smith again for a 20-yard touchdown and, adding the successful PAT, Jacksonville was back in front by 21-14. The Ravens got the ball back on the ensuing kickoff with just over a minute remaining in the half. Testaverde was successful on four passes, three of them to WR Michael Jackson, in getting the ball to the Jacksonville 14 and, on the last play before halftime, Stover booted a 33-yard field goal. The Jaguars were up by 21-17 at the midway point. Jacksonville’s lead didn’t last long in the third quarter, however, as the Ravens struck quickly following a 42-yard return of the second half kickoff by Lewis. Three plays later Testaverde threw to Jackson for a 54-yard touchdown and, with the successful extra point, Baltimore was in front by 24-21. On the third play of the ensuing series, Johnson, already gimpy, was injured after getting off a pass to Smith for a 20-yard gain. 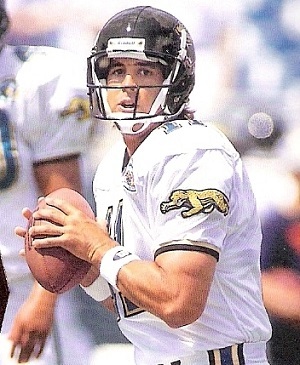 Steve Matthews came in at quarterback and completed three passes as the Jaguars reached the Baltimore 40 before having to punt. Bryan Barker’s kick was downed at the five. Thanks to runs by Byner and Testaverde’s passing, the Ravens were able to move the ball to their 35 before CB Deon Figures intercepted a pass to give the Jaguars possession at their own 44. Johnson was back in at quarterback despite a sprained ankle and, with Means running effectively in addition to short pass completions, Jacksonville advanced to the Baltimore 24 before Means was dropped for a loss on a third-and-two play at the end of the period. Hollis missed a 43-yard field goal try to start the fourth quarter. The Ravens again moved the ball well, this time going 60 yards in 13 plays and putting points on the board. Stover made a 25-yard field goal that stretched the home team’s lead to six points. Starting at their 20 following a touchback on the kickoff, the Jaguars got 25 yards right away on a Johnson completion to McCardell. Four plays later they converted a third-and-six situation as Johnson connected with TE Pete Mitchell for 23 yards and then followed up with a Johnson-to-Smith pass play for a 28-yard touchdown. Hollis kicked the extra point that put the Jaguars back in front by a point with 5:47 left on the clock. The Ravens had three more possessions but couldn’t regain the lead. The first series went three-and-out with a punt, the second lasted just two plays before Figures intercepted a Testaverde pass for the second time, and the last ended at midfield when a fourth-and-18 pass was ruled incomplete. The Jaguars came away with a 28-27 win. Jacksonville outgained the Ravens (411 yards to 373) while Baltimore accumulated more first downs (22 to 19). The Ravens also turned the ball over three times, to one suffered by the Jaguars, although Jacksonville was penalized 11 times to three flags thrown on the home team. Rob Johnson had a fine performance as he completed 20 of 24 passes for 294 yards and two touchdowns with no interceptions. Jimmy Smith had 6 catches for 106 yards and two TDs while Keenan McCardell contributed 6 receptions for 84 yards. Natrone Means ran for 67 yards and a touchdown on 25 carries. For the Ravens, Vinny Testaverde was successful on 24 of 41 throws for 322 yards with three TDs but also three interceptions. Michael Jackson (pictured at right) caught 8 of those passes for 143 yards and a score. Jermaine Lewis had two TDs among his four catches for 73 yards and also added 118 yards on his four kickoff returns. Earnest Byner had 63 yards on 14 rushing attempts. The severe ankle injury kept Johnson out of the Week 2 contest and Brunell was back in action thereafter. Jacksonville went on to an 11-5 record, placing second in the AFC Central and again qualifying for the postseason. The Jaguars lost to Denver in the Wild Card round. The Ravens finished at the bottom of the division at 6-9-1. 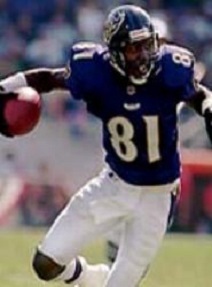 Rob Johnson saw little action the rest of the way but his performance at Baltimore drew the interest of other teams. He was traded to Buffalo during the next offseason for first and fourth round draft choices, although he did not find much success as a full-time starting quarterback in a career that lasted until 2003.